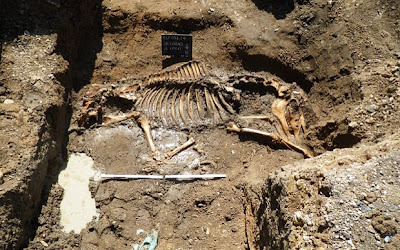 British horse-lovers are hoping that the intact skeleton discovered during the excavation for the new National Heritage Centre for Horseracing and Sporting Art in Newmarket, Suffolk, U.K., are the bones of legendary racehorse Doctor Syntax. On the one hand, this former site of the Royal stables of King Charles II was where the animal was euthanized in 1838, the skeleton matches his height (15 hands). the wear and tear on its joints indicates that it was ridden, and the horse was buried carefully in a specifically dug grave. On the other hand, the smashed skull does not give evidence of the shotgun blast that killed the horse, there is no trace of any other injuries on the skeleton, and the teeth show that the buried horse was 18 to 20 years old whereas Doctor Syntax is believed to have died at the age of 28. Archaeologist Chris Faine of Oxford Archaeology states, "It was certainly a racehorse, all the evidence points to that. I don't think it could be Doctor Syntax, but you would have to carry out DNA tests to make sure."